Tours depart at 8.30 and 13.30, every day from April to October and 4 days per week from November to March. 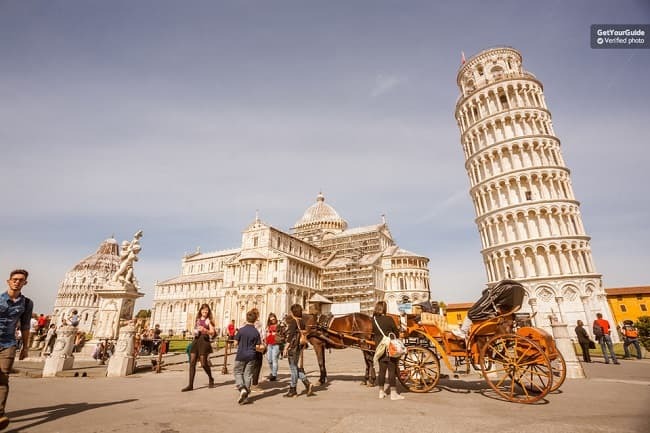 We are comparing Pisa Half-Day Trip with Leaning Tower Skip-the-Line Entry Prices from leading ticket suppliers and Try to find you Cheap tickets prices on the market. From one magnificent Italian city to another, this half day trip takes your from the Center of beautiful Florence, through the stunning Tuscan countryside to the Medieval City of Pisa. This small city is most widely known for its iconic Leaning Tower, an architectural mishap which made Pisa one of the top locations on anyone's Italian travel itinerary. Your day will begin with a guided tour of the historical city, a friendly guide will lead you through the old city gates, along cobblestone streets to the Piazza dei Miracoli. Hear the fun facts and stories of the city and its inhabitants. You will see impressive Palazzo Vescovile and go inside the grand marble Duomo Cathedral, as well as visiting the Baptistery and Monumental Graveyard. Finally you will make your way to Pisa's main attraction, the Leaning Tower, let your guide fill you in on the story of its construction before skipping to the front of the queue and climbing 294 narrow, spiraling steps to a viewpoint. You'll have some free time to take pictures and wander the city at your own pace before meeting the coach and travelling back to Central Venice. If this is your first visit to Pisa then the tour will give you an introduction to the city's history. Ideal for people who appreciate panoramic views. The Leaning Tower of Pisa is an attraction on many peoples ‘bucket' list. Your Experience With Pisa Half-Day Trip with Leaning Tower Skip-the-Line Entry? Travel from the centre of Florence to the iconic Leaning Tower of Pisa in a half day excursion. Save time with a skip the line priority ticket to the Leaning Tower. Climb the stairs to the top of the tower and enjoy stunning panoramic views. Enjoy free time to take pictures and explore the walled city of Pisa. What Pisa Half-Day Trip with Leaning Tower Skip-the-Line Entry Includes? Round trip transportation to Pisa from Central Florence by air conditioned coach. Skip the line entrance to the Cathedral and the Leaning Tower of Pisa. Expert multilingual guide and walking tour of Pisa in English, French, Spanish, Italian, Portuguese or German. Pick-up from certain hotels in Central Florence. Leave Florence by coach – drive to Pisa – guided city tour – visit it Leaning Tower and free time – return to Florence. Don't be shy to ask your guide or fellow tourists to take your picture propping up the leaning tower. Be prepared for crowds during the summertime and holiday seasons. Travelers Reviews about Pisa Half-Day Trip with Leaning Tower Skip-the-Line Entry? Get Your Guide users have given the half-day tour a 4.6 out of 5-star rating. Over 600 Viator and TripAdvisor users have rated this tour with 4.5 out of 5-stars. Comments are generally positive with travellers saying that the tour guide was good and interesting. Certain travellers point out that this tour can be made independently by train but the majority of people who have taken this tour would agree that the convenience of a private bus is worth paying for. Tickets should be presented in electronic or printed form. Tickets are refundable however fees may apply for late cancellations. Children under 8 are not permitted to climb the Leaning Tower, also those with walking difficulties will not be able to climb the tower. Knees and shoulders must be covered to enter Pisa Cathedral. Meeting Point: Central Florence, please arrange with your tour provider.